In Gear! Rooster Juce Home | About Us | Opportunities | Sponsorships | Contact Us! This week the Handmade Men studio was alive with amazing scent, color, and some very happy skin and hair! We had the privilege of experiencing some of the amazing products from Rooster Juce, and we’re excited to share them with you! 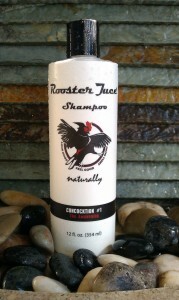 Rooster Juce is an artisan men’s grooming gear shop in California with a unique style and a high standard for ingredients. 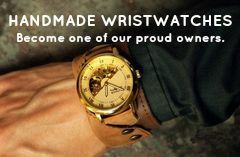 They offer a complete line of goods to help every guy look good, feel good, and smell good with all natural ingredients. Join us as we look at just a few of the great products being created by Rooster Juce, and if you missed our interview with them, see it <here>. There are two ways do do artisan shampoo – right, and wrong. Rooster Juce landed it. This shampoo feels amazing in your hands and in your hair, it smells sublime, and it works. The lather is top notch and it seems to be extremely hydrating and nourishing. The scent of ‘The Awakening’ is just that – it’s vibrant, crisp, clean, and invigorating. Add this men’s handmade shampoo to your morning shower and you can just about skip the coffee! The fragrance also lasts, leaving hair and scalp smelling clean all day long. The ingredients contain plant proteins as well as aloe vera so you’re getting strength, body, and conditioning while you clean! We’ve had the joy of reviewing several types of manly soap here at Handmade Men, but this was our first experience of a vegetable based glycerin soap style – and we’re fans! There is a level of softness and moisturizing in this soap that rivals lotion bars, and a scent that makes it a treat to use. 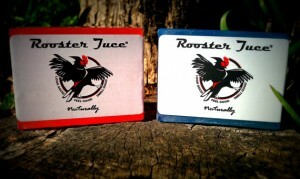 The Rooster Juce 100% vegetable based glycerin soap comes in two fantastic scents – Italian Blood Orange and Waves. Each is a signature scent that is unlike any other. Both are masculine, clean, inspiring, and empowering. The vibrant colors of these bars makes them really fun to have parked in your shower or at your sink! These soaps are a great men’s gift idea, and they would be a fun addition to a house warming present or gym bag. There are few things that most guys are more picky about than their shaving products. Even with all the scruff, men’s faces can be extremely sensitive, and a shave can cause a day full of itching and discomfort. 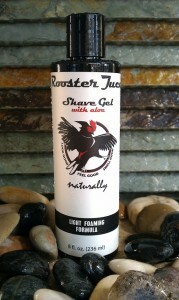 Rooster Juce clearly kept this in mind as they created their light foaming formula shave gel. The consistency is perfect for sink or shower shaving, and it makes shaving with a modern or straight razor a breeze. The foaming action is really pleasant and soothing, and it definitely helps prevent razor burn and irritation. The fragrance of the shave gel is similar to the cologne we’ll explore next. It’s clean, light, and refreshing. The perfect blend of scent, foam, and function! Forget what you’ve heard about big label cologne and take a look at what’s happening in the handmade movement! We’ve experienced many of the top handmade artisan colognes over the past year and all of them have impressed and inspired us. The cologne from Rooster Juce is no exception. The scent is very much in line with the other fragrances used by this shop, and it’s absolutely perfect. Reminiscent of the ocean, a cool breeze, and feeling good. 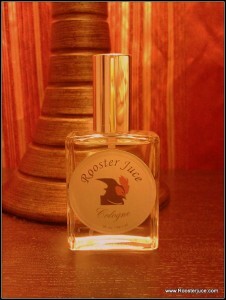 Rooster Juce cologne is subtle and calm. This is not an overpowering or irritating scent like many mass produced cologne styles. Even people who are generally sensitive to strong scent will find this cologne pleasing and approachable. We loved this product – and cologne is a very hard thing to get everyone on board about since tastes differ wildly around here. It’s mature yet playful, calm yet present, and a truly clean and invigorating scent. A definite win! Tagged Cologne, in gear, review, Rooster Juce, Shampoo, Shave Gel, Soap. Bookmark the permalink.